The Synthesizer Sympathizer: Full Elektron Analog Four Announcement, Features are here! 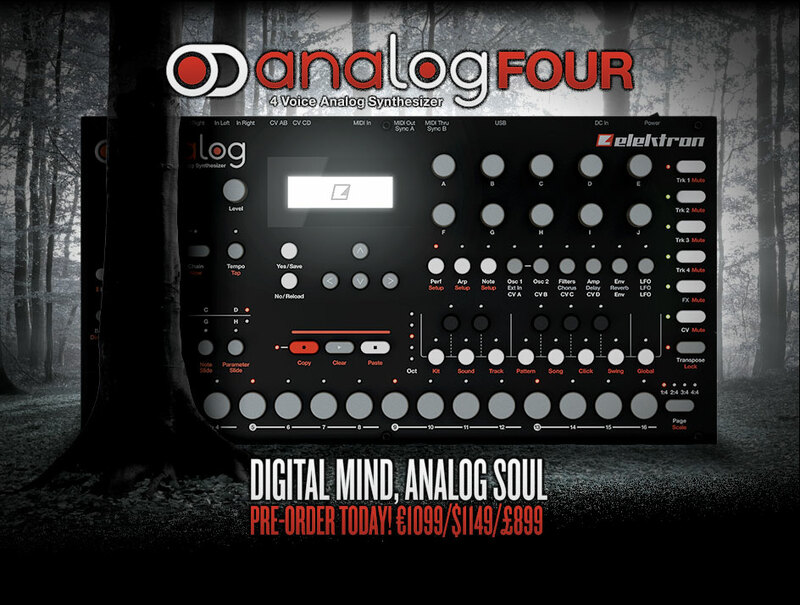 Full Elektron Analog Four Announcement, Features are here! 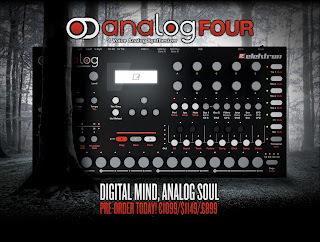 Finally, the full details of the Analog Four are officially out. I've copied and pasted the tech specs, but you can get a full rundown of the new beast here,. There's also a variety of sound demos on Elektron's official Soundcloud (heard above). In case you're wondering, the price is $1149. They will start shipping on December 3rd. Early impressions: The control voltage and sequencer are the real winners here. As I mentioned in the previous post, Elektron have become experts with sequencing through hardware with their other devices, so there are some really exciting possibilities with 4 analog voice tracks and an effects track. Above, the sequences sound pretty awesome. Lots of squelchiness and warmth. The control voltage will please the modular lovers, and those of you who've recently picked up the MiniBrute will be able to interface it with the A4 quite easily. The effects will be a nice touch and make this stand out to live performers. Time will tell how this stands up against the other products on the market-- the closest in functionality to it is the Tetra, but the Analog Four seems to have it beat on sequencing. The additional $300 dollars might put it at a disadvantage, but I'm guessing the Analog Four won't appeal to your standard synth fan-- it seems like a tool for those of you who are really into mastering one piece of gear. Weight: approximately 2.35 kgs (5.18 lbs)"